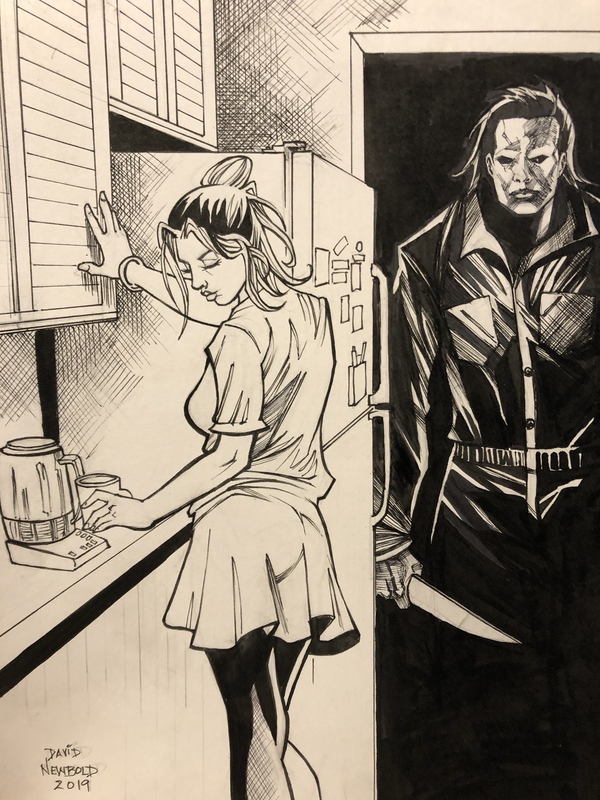 ART CLASH WEEK 6: MICHAEL MYERS AND THE CREEPING DREAD!!! › Forums › THE ART CLASH 2.0 › ART CLASH WEEK 6: MICHAEL MYERS AND THE CREEPING DREAD!!! Who best marked Halloween in February? This topic contains 32 replies, has 6 voices, and was last updated by Newbold 2 months, 1 week ago. SUBJECT: ICONIC IMAGE OF MICHAEL MYERS. CONCEPT: It’s Halloween in February as the challenge this time is to convey and sense of dread, or looming horror, that perfectly fits with Michael Myers. This challenge is to hint at the threat of violence, so it is more subtle than simply showing blood and gore. 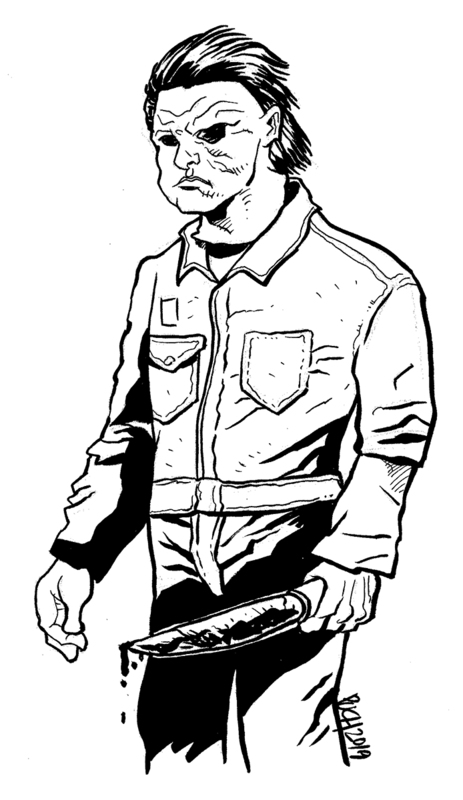 Consider what makes this character so frightening and put that on the page. I’m having some problems fixing in the creeping dread. But I think I have it. While you guys were chattin’, I was hackin’ this out. Challenges/problems I had this time around. I was looking at Castlevania Dracula for inspiration, with his huge proportions mixed with a faux upward shot exaggerating feet, longer legs and arms and smaller head, but I missed on it, so now it looks like he just has a short pelvis with those long arms. It makes him stand more assertively, but I think the mix of intent and execution looks muddled, wrong, off and therefore wrong. Maybe if I actually dropped rhe horizon line..but then you’d miss the little story, lol. I hate how even a simple figure can be bungled when you’re shooting for comics. Maddening, ain’t it? Here you go, Scott. It’s an easy fix. I think you just had the crotch too high. Thankfully, the overalls are a great cover for such things. Just a thought, but even with the exaggerated proportions (which I’m all for), if you use subtle markers to kind of check yourself, you generally won’t have a tough time with the proportions…or at least you’ll avoid second-guessing yourself a lot. Great work! Hey, thanks! He got his dingding back! I think this one is better, and seems more in tune with my present day direction. Do you see any difference between the two, or is it merely an imagined difference in style on my part? I like the second one better as well. I think it has something to do with the control and fluidity of the forms…probably helped a lot by your great inking. The creeping dread of Michael Myers. This is the last scene from Halloween 1, but adapted. Awesome job, Steel! I like so much in this! Kudos to letting him fall back into the background and just chill in his creepiness as the girl looks frantically the wrong way. Only issue I see is the moon. If you want to show a moon and have a small space, leave enough curve to suggest a circle. It’s a minor crit, tho. Great piece and great work! I was very inspired by Jock’s work on this one. I watched this video and found it very inspiring. He mentioned not enjoying drawing something twice (penciling, then inking) and so I thought I would give it a shot. I did a few very loose pencils and NO laying out of perspective guides. I just drew and let the ink do the work. Let me know what you think! Brett, I think we learn from this that you could do this kind of work if you wanted, easily. That said, I feel like Myers loses stature to the scale and impressiveness of the background. 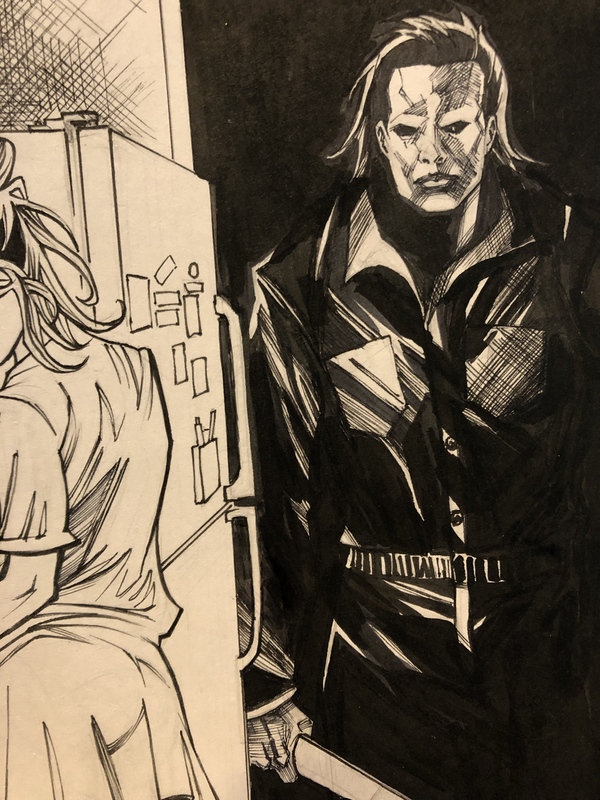 Nice bold inks on your Michael Myers! The line weight differences in the hair, mask and even the pocket stitching you gave extra attention to look great. Left arm seems a little short, particularly elbow to forearm. Thanks for the feedback!!! And you did a great work too, I like your stuff, your inking is really good. Great piece! She is no doubt making Myers his favorite guacamole. Things I like: twist of pose, perspective and doorways. Your Michael Myers looks tough. Inks on paper, ftw! I feel like there were some missed chances on making the highlights on Myers show more form/planes falling in and out of shadow and less shape/silhouette. And a bit in the doorway, too. You do it all, and do more than I do, so I figure you’re okay with my amateur hour critiques. Great work! I did add some more shadows! I also voted for Knight, great work! I watched a documentary about the making of Michael Myers’ mask in Halloween 2018. A key to making it scary was that the mask is emotionless. He’s not happy or sad or angry, just emotionless. I hope this helps, I know it’s a little late. Great job, Knight! Overlapping a plane, like a door, or having someone or something emerge from a portal or closet is always a great way to make your picture seem deeper in space. Knight, that’s DEFINITELY the best piece you’ve done! Great work! Scott, I gave you two slots, just to see which one people preferred, but we’ll compile the results for the two pieces. You did two–you deserve all the votes you get. I voted for Knight! Great job! If people ever want a more serious draw-over critique with my inexpert opinions, lemme know! It wouldn’t be necessarily right so much as how I would change things, YMMV. I voted for Scott #1. I wish I could split my vote between everyone! Looks like Knight won this week(you woln’t win the next). So what’s next? BOOM! I’m calling this for Knight! Knight, buddy, CONGRATULATIONS!!!! I am SOOOOOOO proud of your work on this one! GREAT JOB! This is how you do it. This is how you improve. You work smarter and you keep doing it, time and again. You learn from mistakes and you build on your successes. You study how other people “got it right” and you look at what they did. Learn everything you can about how to and how not to do something. If you keep doing this–IN ANYTHING–you WILL improve! WAY TO GO! Ok, Knight wants us to switch things up and do a battle-damaged (yet victorious) futuristic mech/mecha. I’ll try to figure out how to fit all of that on the new Challenge form 😉 . So, get to designing something cool!